René-Jean-Marie-Joseph Guénon (French: [ʁəne ʒan maʁi ʒozɛf ɡenɔ̃]; 15 November 1886 – 7 January 1951), also known as ʿAbd al-Wāḥid Yaḥyá (Arabic: عبد الواحد يحيى‎), was a French author and intellectual who remains an influential figure in the domain of metaphysics, having written on topics ranging from sacred science and traditional studies, to symbolism and initiation. Guénon aged 38 (1925 studio photo). He wrote and published in French, and his works have been translated into more than twenty languages. He is considered to be an important writer in the Traditionalist School of philosophy. René Guénon was born in Blois, a city in central France approximately 160 km (100 mi) from Paris. Guénon, like most Frenchmen of the time, was born into a Roman Catholic family. Little is known of his family, although it appears that his father was an architect. By 1904, Guénon was living as a student in Paris, where his studies focused on mathematics and philosophy. He was known as a brilliant student, notably in mathematics, in spite of his poor health. As a young student in Paris, Guénon observed and became involved with some students who were, at that time, under the supervision of Gérard Encausse, alias Papus. Guénon soon discovered that the Esoteric Christian Martinist order, supervised by Papus, was irregular. He joined the Gnostic Church founded by Fabre des Essarts-Synesius. Under the name "Tau Palingenius" Guénon became the founder and main contributor of a periodical review, La Gnose ("Gnosis"), writing articles for it until 1922. From his incursions into the French occultist and pseudo-masonic orders, he despaired of the possibility of ever gathering these diverse and often ill-assorted doctrines into a "stable edifice". In his book The Reign of Quantity and the Signs of the Times he also pointed out what he saw as the intellectual vacuity of the French occultist movement, which, he wrote, was utterly insignificant, and more importantly, had been compromised by the infiltration of certain individuals of questionable motives and integrity. [non-primary source needed] Following his desire to join a regular masonic obedience, he became a member of the Thebah Lodge of the Grande Loge de France following the Ancient and Accepted Scottish Rite. Around this time (according to indications reproduced by his biographer Paul Chacornac), it is possible that René Guénon became acquainted with Hinduism, specifically via the initiatic lineage of Shankarâchârya, and with Taoism, due to his friendship with Georges-Albert Puyou de Pouvourville, alias Matgioi. It is likely that Guénon learned to use opium from de Pouvourville, and Guénon later described the use of opium as an aid to meditation. He met Léon Champrenaud, alias Abdul-Haqq, and John-Gustav Ageli, alias Abdul-Hadi who had been initiated by Abder-Rhaman el Kébir in Cairo. According to Paul Chacornac, Guénon chose a conversion to Islam rather than to Hinduism because the Hindu ritual life is not compatible with the Western way of life, whereas following Islamic rituals is compatible with modern Western life. He believed that Islam is the only traditional religious world that is practically accessible to Westerners. In 1910, Guénon was initiated into the Sufi Shadhili order by Ivan Aguéli, taking the name "ʿAbd al-Wāḥid Yaḥyā". In 1917, Guénon began a one-year stay at Sétif, Algeria, teaching philosophy to college students. After World War I, he left teaching to dedicate his energies to writing; his first book, Introduction to the Study of the Hindu Doctrines, was published in 1921. The book was first proposed as a thesis, but the thesis was rejected by Indologist Sylvain Lévi. From 1925 Guénon became a contributor to a review edited by P. Chacornac, Le Voile d'Isis ("The Veil of Isis"); after 1935 and under Guénon's influence, this periodical became known as Les Etudes Traditionnelles ("Traditional Studies"). Although the exposition of Hindu doctrines to European audiences had already been attempted in piecemeal fashion at that time by many orientalists, Guénon's Introduction to the Study of the Hindu Doctrines advanced its subject in a uniquely insightful manner, by referring to the concepts of metaphysics and Tradition in their most general sense, which Guénon precisely defined, along with the necessary distinctions and definitions of seemingly unambiguous terms such as religion, tradition, exoterism, esoterism and theology. Guénon explained that his purpose was not to describe all aspects of Hinduism, but to give the necessary intellectual foundation for a proper understanding of its spirit. [non-primary source needed] The book also stands as a harsh condemnation of works presented by certain other European writers about Hinduism and Tradition in general; according to Guénon, such writers had lacked any profound understanding of their subject matter and of its implications. The book also contains a critical analysis of the political intrusions of the British Empire into the subject of Hinduism (and India itself) through Madame Blavatsky's Theosophy. In September 1920, Père Peillaube asked Guénon to write a book against the Theosophical Society. In 1921, Guénon debuted a series of articles in the French Revue de Philosophie, which, along with some supplements, led to the book Theosophy: History of a Pseudo-Religion. His critique of Theosophy was received positively by conservative Catholics. However his later book Orient et Occident distanced him from his Catholic supporters. His friend and erstwhile supporter Jacques Maritain argued that Guénon's views were "radically irreconcilable with the [Catholic] faith and called them a "Hinduist restoration of ancient Gnosis, mother of heresies". Maritain later unsuccessfully tried to have Guénon's works put on the Catholic Index of Prohibited Books. During the decade 1920–1930, Guénon began to acquire a broader public reputation, and his work was noted by various intellectual and artistic figures both within and outside of Paris. Also at this time were published some of his books explaining the "intellectual divide" between the East and West, and the peculiar nature, according to him, of modern civilization: Crisis of the Modern World, and East and West. In 1927 was published the second major doctrinal book of his works: Man and His Becoming according to the Vedânta, and in 1929, Spiritual Authority and Temporal Power. The last book listed offers a general explanation of what Guénon saw as the fundamental differences between "sacerdotal" (priestly or sacred) and "royal" (governmental) powers, along with the negative consequences arising from the usurpation of the prerogatives of the latter with regard to the former. From these considerations, René Guénon traces to its source the origin of the modern deviation, which, according to him, is to be found in the destruction of the Templar order in 1314. In 1930, Guénon left Paris for Cairo. During his lengthy sojourn in Egypt, René Guénon carried on an austere and simple life, entirely dedicated to his writings and spiritual development. In 1949, he obtained Egyptian citizenship. Sedgwick wrote about Guénon's life in Egypt that even though he continued his interest in Hinduism and other religions, Guénon's own practice was purely Islamic. He is "not known ever to have recommended anyone to become a Hindu, whereas he introduced many to Islam". Urged on by some of his friends and collaborators, Guénon agreed to establish a new Masonic Lodge in France founded upon his "Traditional" ideals, purified of what he saw as the inauthentic accretions which so bedeviled other lodges he had encountered during his early years in Paris. This lodge was called La Grande Triade ("The Great Triad"), a name inspired by the title of one of Guénon's books. The first founders of the lodge, however, separated a few years after its inception. Nevertheless, this lodge, belonging to the Grande Loge de France, remains active today. René Guénon died on Sunday, January 7, 1951; his final word was "Allah". In 1921, Guénon published an Introduction to the Study of the Hindu Doctrines. His goal, as he writes it, is an attempt at presenting to westerners eastern metaphysics and spirituality as they are understood and thought by easterners themselves, while pointing at what René Guénon describes as all the erroneous interpretations and misunderstandings of western orientalism and "neospiritualism" (for the latter, notably the proponents of Madame Blavatsky's Theosophy). Right from that time, he presents a rigorous understanding, not only of Hindu doctrines, but also of eastern metaphysics in general. An exposition of fundamental metaphysical principles: Introduction to the Study of the Hindu Doctrines which contains the general definition of the term "tradition" as Guénon defines it, Man and His Becoming according to the Vedânta, The Symbolism of the Cross, The Multiple States of Being, The Metaphysical Principles of the Infinitesimal Calculus, Oriental Metaphysics. Studies in symbolism (comprising many articles he wrote for the journal Le Voile d'Isis which became later known under the name Etudes Traditionnelles). These studies in symbolism were later compiled by Michel Valsan in the posthumous book Symbols of Sacred Science. The studies The Great Triad, Traditional Forms & Cosmic Cycles, Insights into Islamic Esoterism & Taoism and The King of the World (alternately translated as Lord of the World) are also mostly about symbolism. Fundamental studies related to Initiation, a subject completely re-exposited by Guénon from the traditional perspective: Perspectives on Initiation, Initiation and Spiritual Realisation, The Esoterism of Dante. Criticism of the modern world and of "neospiritualism": East and West, The Crisis of the Modern World, Spiritual Authority and Temporal Power, Theosophy: History of a Pseudo-Religion, The Spiritist Fallacy and The Reign of Quantity & the Signs of the Times, the latter book being often considered as his masterpiece as an explanation of the modern world from the traditional perspective. Guénon's writings make use of words and terms of fundamental signification, which receive a precise definition throughout his books. These terms and words, although receiving a usual meaning and being used in many branches of human sciences, have, according to René Guénon, lost substantially their original signification (e.g. words such as "metaphysics", "initiation", "mysticism", "personality", "form", "matter"). [non-primary source needed] He insisted notably on the danger represented by the perversion of the signification of words seen by him as essential for the study of metaphysics. Introduction to the Study of the Hindu Doctrines, published in 1921, on topics which were later included in the lecture he gave at the Sorbonne on December 17, 1925 ("Oriental Metaphysics"), consists of four parts. The first part ("preliminary questions") exposes the hurdles that prevented classical orientalism from a deep understanding of eastern doctrines (without forgetting that Guénon had of course in view the orientalism of his time): the "classical prejudice" which "consists essentially in a predisposition to attribute the origin of all civilization to the Greeks and Romans", the ignorance of certain types of relationships between the ancient peoples, linguistic difficulties, and the confusions arising about certain questions related to chronology, these confusions being made possible through the ignorance of the importance of oral transmission which can precede, to a considerable and indeterminate extent, the written formulation. A fundamental example of that latter mistake being found in the orientalist's attempts at providing a precise birth date to the Vedas sacred scriptures. The "general characters of eastern thought" part focuses on the principles of unity of the eastern civilizations, and on the definition of the notions of "tradition" and "metaphysics". Guénon also proposes a rigorous definition of the term "religion", and states the proper differences between "tradition", "religion", "metaphysics" and "philosophical system". The relations between "metaphysics" and "theology" are also explored, and the fundamental terms of "esoterism" and "exoterism" are introduced. A chapter is devoted to the idea of "metaphysical realization". The first two parts state, according to Guénon, the necessary doctrinal foundations for a correct understanding of Hindu doctrines. The Introduction to the study of the Hindu doctrines had, among its objectives, the purpose of giving the proper intellectual basis to promote openness to the study of eastern intellectuality. The study of Hindu doctrines is continued in his book Man and his Becoming according to the Vedanta by taking the specific viewpoint of the human being's constitution according to the Vêdantâ: Guénon states that his goal is not to present a synthetic exposition of all vedic doctrines "which would be quite an impossible task", but to consider "a particular point of that doctrine", in that case the definition of the human being, in order to contemplate afterwards other aspects of metaphysics. syncretism can be recognized wherever one finds elements borrowed from different traditional forms and assembled together without any awareness that there is only one single doctrine of which these forms are so many different expressions or so many adaptations related to particular conditions related to given circumstances of time and place. Narayana is one of the names of Vishnu in the Hindu tradition, and signifies literally "He who walks on the Waters", with an evident parallel with the Gospel tradition. The "surface of the Waters", or their plane of separation, is described as the plane of reflection of the "Celestial Ray". It marks the state in which the passage from the individual to the universal is operative, and the well-known symbol of "walking on the Waters" represents emancipation from form, or liberation from the individual condition (René Guénon, The Multiple States of Being, chapter 12, "The two chaoses"). If we [...] define Being in the universal sense as the principle of manifestation, and at the same time as comprising in itself the totality of possibilities of all manifestation, we must say that Being is not infinite because it does not coincide with total Possibility; and all the more so because Being, as the principle of manifestation, although it does indeed comprise all the possibilities of manifestation, does so only insofar as they are actually manifested. Outside of Being, therefore, are all the rest, that is all the possibilities of non-manifestation, as well as the possibilities of manifestation themselves insofar as they are in the unmanifested state; and included among these is Being itself, which cannot belong to manifestation since it is the principle thereof, and in consequence is itself unmanifested. For want of any other term, we are obliged to designate all that is thus outside and beyond Being as "Non-Being", but for us this negative term is in no way synonym for 'nothingness'. Hermes' caduceus: example of a symbol associated to the possession of lesser mysteries, and showing an example of horizontal duality (the two snakes' heads are placed in the horizontal dual position, hence referring to apparent dualities such as life and death). In Studies in Hinduism, Guénon mentions a relation between the symbol and the Kundalini shakti. In his book Perspectives on initiation, Guénon clarifies the signification given by the ancient Greeks to the classical names of lesser and greater mysteries: "they are not different "types" of initiations, but stages or degrees of a same initiation". Lesser mysteries lead to the "perfection of the human state", in other words to "something traditionally designated by the restoration of the "primordial state", a state that Dante, in the Divine comedy, relates symbolically to the "terrestrial paradise". 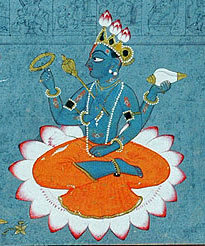 On another hand, "greater mysteries" refer properly to "the realization of supra-human states"; they correspond to the Hindu doctrine of "deliverance" (Moksha) and to what Islamic esoterism calls the "realization of the Universal Man": in that latter tradition, "lesser" and "greater" mysteries correspond exactly to the signification of the terms "el-insân el-qadîm" (the Primordial Man) and "el-insan el-kâmil" (the Universal Man). These two phases are related to an interpretation of the symbolism of the cross with the notions of "horizontal" and "vertical" realization. They also correspond respectively to what is traditionally designated in western hermeticism by the terms royal initiation and sacerdotal initiation. While it is acknowledged that symbolism refers to something very different from a mere 'code', an artificial or arbitrary meaning, and that "it holds an essential and spontaneous echoing power", for René Guénon, this 'echoing power' goes immensely farther than the psychological realm: symbolism is "the metaphysical language at its highest", capable of relating all degrees of universal Manifestation, and all the components of the Being as well: symbolism is the means by which man is capable of "assenting" orders of reality that escape, by their very nature, any description by ordinary language. This understanding of the profound nature of symbolism, writes René Guénon, has never been lost by an intellectual (i.e. spiritual) elite in the East. It is inherent in the transmission of initiation which, he says, gives the real key to man to penetrate the deeper meaning of the symbols; in this perspective, meditation on symbols (visual or heard, dhikr, repetition of the Divine Names) is an integral part both of initiation and of spiritual realization. For René Guénon art is above all knowledge and understanding, rather than merely a matter of sensitivity. Similarly, the symbolism has a conceptual vastness "not exclusive to a mathematical rigor": symbolism is before all a science, and it is based, in its most general signification, on "connections that exist between different levels of reality". And, in particular, the analogy itself, understood following a formula used in Hermeticism as the "relation of what is down with what is above" is likely to be symbolized: there are symbols of the analogy (but every symbol is not necessarily the expression of an analogy, because there are correspondences that are not analogical). The analogical relation essentially involves the consideration of an "inverse direction of its two terms", and symbols of the analogy, which are generally built on the consideration of the primitive six-spoke wheel, also called the chrism in the Christian iconography, indicate clearly the consideration of these "inverse directions"; in the symbol of the Solomon's seal, the two triangles in opposition represent two opposing ternaries, "one of which is like a reflection or mirror image of the other" and "this is where this symbol is an exact representation of analogy". This consideration of a "reverse meaning" allows René Guénon to propose an explanation of some artistic depictions, such as that reported by Ananda Coomaraswamy in his study "The inverted tree": some images of the "World Tree", a symbol of universal Manifestation, represent the tree with its roots up and its branches down: the corresponding positions correspond to two complementary points of view that can be contemplated: point of view of the manifestation and of the Principle. This consideration of "reverse meaning" is one of the elements of a "science of symbolism" in which Guénon refers to, and used by him in many occasions. Guénon was critical of modern interpretations regarding symbolism which often rested on naturalistic interpretations of the symbol in question which Guénon regarded as a case of the symbol of the thing being mistaken for the thing itself. He was also critical of the psychological interpretations found in the psychiatrist Carl Jung. Guénon denounced the Theosophical Society, many pseudo-Masonic orders in the French and Anglo-Saxon occult scenes and the Spiritist movement. They formed the topic of two of his major books written in the 1920s, Theosophy: History of a Pseudo-Religion and The Spiritist Fallacy. He denounced the syncretic tendencies of many of these groups, along with the common Eurocentric misconceptions that accompanied their attempts to interpret Eastern doctrines. René Guénon especially develops some aspects of what he refers to as the manifestation of "antitraditional" currents in the nineteenth and twentieth centuries. His first book on that subject is devoted to a detailed historical examination of Madame Blavatsky's theosophy: Theosophy: History of a Pseudo-Religion. Guénon examines the role and intervention that played in that movement organizations that are described in more detail in The Reign of Quantity and the Signs of the Times, as under what he called the "pseudo-initiation"; in particular what he calls "pseudo-Rosicrucian" organizations holding no affiliation with the real authentic Rosicrucians, like the Societas Rosicruciana in Anglia founded in 1867 by Robert Wentworth Little, the "Order of the esoteric Rose-Cross" of Dr. Franz Hartmann etc. He denounces the syncretic nature of theosophy and its connection with the theory of evolution in "The Secret Doctrine" (Madame Blavastky's main work); he also examines the role and relationship that the Theosophical Society had with multitude of "pseudo-initiatic" organizations, among others the O.T.O. founded in 1895 by Carl Kellner and propagated in 1905 by Theodor Reuss, and the Golden Dawn, to which belongs a large number of key figures of the Anglo-Saxon "neo-spiritualism" of the early twentieth century etc. Some authors have argued that Guénon's analysis of Theosophy is flawed and that it is debatable whether Theosophy is really hostile to Islam and Christianity. These are precisely some members of the "inner circle" of the H.B. of L., to which belonged Emma Hardinge Britten, who would have produced the phenomena giving rise to spiritist movement that is to say, another "antitraditional" current born in 1848. To support this assertion, he relies on statements from Emma Hardinge Britten herself, which will be confirmed much later, in 1985, by the publication from French publishing house Editions Archè of the documents of the H.B. of L. This organization would have received in part the legacy of other secret societies, including the "Eulis Brotherhood", to which belonged Paschal Beverly Randolph, a character designated by René Guénon as "very enigmatic" who died in 1875. He denounces "the confusion of the psychic and the spiritual" and especially the psychoanalytic interpretation of symbols, including the Jungian branch of it, which he condemned with the greatest firmness, seeing in it the beginnings of a reversed – or at least distorted – interpretation of symbols. This aspect is reflected in some studies, especially in a book published in 1999 by Richard Noll who incidentally speaks of the role played by the Theosophical Society in Jung. A commentator of René Guénon, Charles-André Gilis, has published a book in 2009 which proposes some insights and developments of the idea of 'counter-tradition' introduced by Guénon, based on Mohyddin Ibn Arabi's writings ("The profanation of Israël in the light of Sacred Law"). The impact of Guénon's work has been very broad, including many artists, in particular in the surrealist movement. For instance, writers and artists influenced by Guénon include Alain Danielou, André Malraux, Albert Gleizes, André Breton, Antonin Artaud, Marco Pallis, René Daumal, Raymond Queneau, Georges Bataille and Paul Ackerman. René Guénon had a discrete impact in the field of comparative religion, particularly on the young Mircea Eliade and on contemporary scholars such as Huston Smith, William Chittick, Harry Oldmeadow, James Cutsinger and Hossein Nasr. For instance, Carl Schmitt wrote in 1942 that Guénon was an important "teacher" for Mircea Eliade. However, Eliade also wrote that he preferred the writings of the tradionalist Ananda Coomaraswamy to both Guénon and Evola, whom he defined as "dilettantes" in an essay written in 1937, and Eliade also thought that Sri Aurobindo was more "perfected" than Guénon. Just after World War I, Guénon was close to some circles of the conservative French right such as the neo-thomists, above all Jacques Maritain, and some members of the right-wing political movement Action Française including Léon Daudet, Jacques Bainville (Maritain, as many Catholics, stopped any links with the Action française after the papal condemnation of the movement in 1926). The main goal of Guénon during this period was to convince Maritain and the Catholic Church to revitalize Christianity through a dialogue with oriental religions and he envisaged a restoration of traditional "intellectualité" in the West on the basis of Roman Catholicism and Freemasonry. [note 1] The project was unsuccessful. Several authors see in Guénon a successor of the monarchist, ultramontanist Joseph de Maistre, who was a Freemason like Guénon. Even though Guénon repeated on many occasions that he was apolitical and that he rejected in advance any political interpretation of his work, he influenced several writers who are on the far right of the political spectrum. The main reason is the fact that he had a strong influence on Julius Evola with whom he kept up an epistolary correspondence. In addition, Carl Schmitt, the conservative German jurist, told scholar of comparative religion Mircea Eliade that he regarded René Guénon as “the most interesting man alive today”. Guénon has remained on the reading lists of the some members of the New Right. For instance, the work of Russian New Right author Aleksander Dugin is influenced by René Guénon and Julius Evola. Dugin repeatedly claimed Guénon as one of his teachers. Olavo de Carvalho and Steve Bannon are others examples of a contemporary New Right authors influenced by Guenon's philosophy. However, several academic studies dismiss now any intellectual connection between Guénon and monarchist, far right politics. In a study based on the correspondences exchanged between Guénon and Evola and also some articles, P.-G. de Roux has pointed the harsh criticism of Guénon against Evola. In the same manner, in his book Guénon ou le renversement des clartés, French scholar Xavier Accart disputes the connection made between the Traditionalist school and the far right movements. He claims, for instance, that Guenon was highly critical of Evola's political involvements and was worried about the possible confusion between his own ideas and Evola's. Guénon also clearly denounced the ideology of the fascist regimes in Europe before and during the Second World War. Guénon consented to having extracts of his writings published in the fascist newspaper Regime fascista, a newspaper curated by Evola, but always refused to publish Evola's books and articles. Some authors consider that Evola should not be considered a member of the Traditionalist school due to the large differences between his thought and that of Guénon. A well known if controversial definition by Bergier and Louis Pauwels defined Adolf Hitler as Guénon plus the 'Panzerdivisonen'. However, Pauwels recognized himself on the radio later that the connection between Guénon and Hitler was totally wrong. In addition, Guénon also influenced many leftist or even apolitical writers and artists. Alain de Benoist, the founder of the New Right declared in 2013 on the radio that the influence of Guénon on his political school has been globally very weak. [note 2] In addition, Guénon was an outspoken opponent of the concept of Aryan race or Indo-European race and of any form of nationalism. Biographers also recall that Guénon disclaimed in his writings any connection to a "school" or "movement". George Santayana compared him to C. S. Lewis. The religious scholar Huston Smith acknowledges a debt to Guénon and the Traditionalist School while remaining outside the school as an academic. Introduction générale à l'étude des doctrines hindoues, Paris, Marcel Rivière, 1921, many editions. Le Théosophisme, histoire d'une pseudo-religion, Paris, Nouvelle Librairie Nationale, 1921, many editions. L'Erreur spirite, Paris, Marcel Rivière, 1923, many editions including: Éditions Traditionnelles. ISBN 2-7138-0059-5. Orient et Occident, Paris, Payot, 1924, many editions, including: Guy Trédaniel/Éditions de la Maisnie, Paris. ISBN 2-85829-449-6. L'Homme et son devenir selon le Vêdânta, Paris, Bossard, 1925, many editions, including: Éditions Traditionnelles. ISBN 2-7138-0065-X. L'Ésotérisme de Dante, Paris, Ch. Bosse, 1925, many editions, including: Éditions Traditionnelles, 1949. Le Roi du Monde, Paris, Ch. Bosse, 1927, many editions, including: Gallimard, Paris. ISBN 2-07-023008-2. La Crise du monde moderne, Paris, Bossard, 1927, many editions, including: Gallimard, Paris. ISBN 2-07-023005-8. Autorité spirituelle et pouvoir temporel, Paris, Vrin, 1929, many editions, including: (1952) Guy Trédaniel/Éditions de la Maisnie, Paris. ISBN 2-85-707-142-6. Saint Bernard, Publiroc, 1929, re-edited: Éditions Traditionnelles. Without ISBN. Le Symbolisme de la Croix, Véga, 1931, many editions, including: Guy Trédaniel/Éditions de la Maisnie, Paris. ISBN 2-85-707-146-9. Les États multiples de l'Être, Véga, 1932, many editions, including: Guy Trédaniel/Éditions de la Maisnie, Paris. ISBN 2-85-707-143-4. La Métaphysique orientale, Editions traditionnelles, 1939, many editions. This is the written version of a conference given at The Sorbonne University in 1926. Le Règne de la Quantité et les Signes des Temps, Gallimard, 1945, many editions. Les Principes du Calcul infinitésimal, Gallimard, 1946, many editions. Aperçus sur l'Initiation, Éditions Traditionnelles, 1946, many editions. La Grande Triade, Gallimard, 1946, many editions. Aperçus sur l'ésotérisme chrétien, Éditions Traditionnelles (1954). ISBN (?). Aperçus sur l'ésotérisme islamique et le taoïsme, Gallimard, Paris,(1973). ISBN 2-07-028547-2. Comptes rendus, Éditions traditionnelles (1986). ISBN 2-7138-0061-7. Études sur l'Hindouisme, Éditions Traditionnelles, Paris (1967). ISBN (?). Études sur la Franc-maçonnerie et le Compagnonnage, Tome 1 (1964) Éditions Traditionnelles, Paris. ISBN 2-7138-0066-8. Études sur la Franc-maçonnerie et le Compagnonnage, Tome 2 (1965) Éditions Traditionnelles, Paris. ISBN 2-7138-0067-6. Formes traditionnelles et cycles cosmiques, Gallimard, Paris (1970). ISBN 2-07-027053-X. Initiation et Réalisation spirituelle, Éditions Traditionnelles, 1952. ISBN 978-2-7138-0058-0. Mélanges, Gallimard, Paris (1976). ISBN 2-07-072062-4. Symboles de la Science sacrée (1962), Gallimard, Paris. ISBN 2-07-029752-7. Articles et Comptes-Rendus, Tome 1, Éditions Traditionnelles (2002). ISBN 2-7138-0183-4. Recueil, Rose-Cross Books, Toronto (2013). ISBN 978-0-9865872-1-4. Fragments doctrinaux, doctrinal fragments from Guénon's correspondence (600 letters, 30 correspondents). Rose-Cross Books, Toronto (2013). ISBN 978-0-9865872-2-1. ^ Cf. among others his Aperçus sur l'ésotérisme chrétien (Éditions Traditionnelles, Paris, 1954) and Études sur la Franc-maçonnerie et le Compagnonnage (2 vols, Éditions Traditionnelles, Paris, 1964–65) which include many of his articles for the Catholic journal Regnabit. ^ On Radio Courtoisie (20 May 2013), during the programme Le Libre Journal de la resistance française presented by Emmanuel Ratier and Pascal Lassalle. ^ Chacornac, Paul (1 May 2005). The Simple Life of Rene Guenon. Sophia Perennis. p. 7. ISBN 1-59731-055-7. Retrieved 2 May 2017. ^ René Guénon's works dealing with various aspects of sacred science are collected in the book which appeared in its first English translation as Fundamental Symbols: The Universal Language of Sacred Science, Quinta Essentia, 1995, ISBN 0-900588-77-2, then, in another translation, as Symbols of Sacred Science, translated by Henry D. Fohr, Sophia Perennis, 2001, ISBN 0-900588-78-0. There were two original French editions, both under the title Symboles fondamentaux de la Science sacrée, Editions Gallimard, Paris. The first contained a foreword followed by notes and comments by Michel Valsan, the second did not contain these additions. ^ Paul Chacornac, The Simple Life of Rene Guenon, Sophia Perennis, 2005, p. 21. ^ The Reign of Quantity and the Signs of the Times, chapter "The pseudo-initiation". ^ Jean-Claude Frere: Une Vie en Esprit, in Le Nouveau Planete, Rene Guenon: l'Homme et son Message 15 April 1970 p 12. ^ P. Chacornac, The Simple Life of René Guénon, chapter III: Ex oriente lux. ^ Paul Furlong, Social and Political Thought of Julius Evola, 2011, Routledge. ^ c.f. Charles-André Gilis, Introduction à l'enseignement et au mystère de René Guénon (Introduction to the teaching and mystery of René Guénon), chapter VII, Editions Traditionnelles, Paris, ISBN 2-7138-0179-6, and also P. Chacornac, The Simple Life of René Guénon, chapter III: Ex oriente lux. In a letter to T. Grangier dated June 28, 1938, Guénon writes: "mon rattachement aux organisations initiatiques islamiques remonte exactement à 1910" ("my linking with islamic initiatic organizations dates back precisely to 1910"). ^ P. Chacornac, The Simple Life of René Guénon, chapter VI, Calls of the East. ^ Introduction to the Study of the Hindu Doctrines, part III, chapter VII, Shivaïsm and Vishnuïsm: "our goal is not to expose the doctrines themselves, but only to point the proper spirit necessary to study them..."
^ René Guénon Introduction to the Study of the Hindu Doctrines, part IV, chapters III and IV. ^ X. Accart, L'Ermite de Duqqi, Archè, Milano, 2001, chapter: "René Guénon diaphane au Caire". ^ J.-B. Aymard, La naissance de la loge "La Grande Triade" dans la correspondance de René Guénon à Frithjof Schuon in Connaissance des religions, special issue on René Guénon, n° 65–66, pp. 17–35. The integral version of this text can be found here (in French). ^ Paul Chacornac, The simple life of René Guénon, 2005, p. 98. ^ "For all his intellectuals skills might be, it seems unlikely that he succeeded just by himself or with the help of a few books in getting the profound and enlightening understanding of the Vêdânta he seems to have acquired by the age of 23" in P. Feuga, "René Guénon et l'Hindouisme", Connaissance des Religions, n. 65–66, 2002. ^ Cf. for instance The Eastern Metaphysics and Introduction to the Study of the Hindu Doctrines w.r.t. the meaning of the word "metaphysics", the first chapter of The Reign of Quantity and the Signs of the Times on the meanings of the words "form" and "matter", the chapter "Kundalini-Yoga" in his Studies on Hinduism about the translation of Sanskrit word samâdhi as "ecstasy", Man and his Becoming according to Vedânta on the word "personality", Theosophism: History of a Pseudo-Religion on the word "theosophy" etc. ^ Luc Benoist, L'oeuvre de René Guénon, in La nouvelle revue française, 1943 (in French). ^ The Multiple states of the Being, Preface, p. 1. ^ The Multiple states of the Being, chapter "Possibles and compossibles", p. 17. ^ The Multiple states of the Being, chapter: "Being and Non-Being". ^ a b c d Perspectives on initiation, chap. XXXIX: Greater mysteries and lesser mysteries. ^ René Guénon, The Esoterism of Dante. ^ Gilbert Durand, Les structures anthropologiques de l'imaginaire. Introduction à l'archétypologie générale, PUF, 1963 (Introduction et conclusion, passim), p. 21 (in french). ^ Introduction to the study of the Hindu Doctrines, part II, chapter VII: Symbolism and anthropomorphism. ^ Introduction to the Study of the Hindu Doctrines. ^ Perspectives on initiation, chapters XVI, XVII and XVIII. ^ General Introduction to the Study of Hindu doctrines, p.116. ^ a b René Guénon, Symbols of analogy. ^ The Reign of Quantity and the Signs of the Times. Sophia Perennis, 2004. ^ The Spiritist fallacy, "The origins of spiritism" (chapter 2). ^ The Spiritist fallacy, p. 19. ^ The Reign of Quantity and the Signs of the Times, chapter 35 p. 235. ^ Symbols of Sacred Science, Tradition and the 'Unconscious', p. 38. ^ Such as P. Geay's PhD thesis: "Hermes trahi" ("Hermes betrayed", in french). ^ The Jung Cult: Origins of a Charismatic Movement (Princeton: Princeton University Press), ISBN 0-684-83423-5. ^ On this subject, however, see the review by Anthony Stevens, On Jung (1999) about Noll's book. ^ Ch.-A. Gilis, "The profanation of Israël in the light of Sacred Law", translated by R. Beale with a foreword by Abd al-Jabbâr Khouri, Le Turban Noir publishing house, Paris, 2009. ^ "RENE GUENON ET L'HINDOUISME". pierrefeuga.free.fr. Retrieved 17 March 2018. ^ Jean-Pierre Laurant: René Guénon. ^ Eddy Batache, « René Guénon et le surréalisme », dans le « Cahier de l'Herne » consacré à René Guénon, p. 379. ^ Prévost, Pierre : Georges Bataille et René Guénon, Jean Michel Place, Paris. (ISBN 2-85893-156-9). ^ Ackerman, monographie sous la direction d'André Parinaud et Simone Ackerman, Éditions Mayer, 1987. ^ Oxford University Press, Description: "Against the Modern World. Traditionalism and the Secret Intellectual History of the Twentieth Century"
^ a b Grottanelli Cristiano. Mircea Eliade, Carl Schmitt, René Guénon, 1942. In: Revue de l'histoire des religions, tome 219, n°3, 2002. pp. 325-356. ^ a b c Lindenberg Daniel. René Guénon ou la réaction intégrale. In: Mil neuf cent, n°9, 1991. Les pensées réactionnaires. pp. 69-79. ^ Mircea Eliade’s The Portugal Journal, trans. Mac Linscott Ricketts (Albany, N.Y.: SUNY Press, 2010), see also Grottanelli Cristiano. Mircea Eliade, Carl Schmitt, René Guénon, 1942. In: Revue de l'histoire des religions, tome 219, n°3, 2002. pp. 325-356. ^ "L'œuvre de Douguine au sein de la droite radicale française". www.diploweb.com. Retrieved 17 March 2018. ^ de Carvalho, Olavo (1981). "O homem e a sua lanterna, RENÉ GUÉNON O MESTRE DA TRADIÇÃO CONTRA O REINO DA DETURPAÇÃO" (107 ed.). Planeta (revista). ^ "A derradeira análise da obra de Olavo de Carvalho, para nunca ter de lê-lo" (in Portuguese). Época (Brazilian magazine). ^ C.f. André Lefranc, « Julius Evola contre René Guénon » and P. Geay "René Guénon récupéré par l'Extrême-Droite " LRA 16, 2003. ^ Pierre-Guillaume de Roux in Cahiers de l'Unité, n°5, 2017. ^ a b c Accart, Xavier : Guénon critique des régimes totalitaires dans les années 1930, La Règle d'Abraham, september 2015, Ubik éditions. ^ Julius Evola, Ricognizioni: uomini e problemi (Rome: Edizioni Mediterranee, 1974). ^ Patrick Geay : René Guénon récupéré par l'extrême droite, La Règle d'Abraham, september 2015, Ubik éditions. ^ "GUÉNON OU LE RENVERSEMENT DES CLARTÉS. Influence d'un métaphysicien sur la vie littéraire et intellectuelle française (1920–1970)" by Xavier Accart, 2005, Arché. ^ Daniel Lindenberg, revue Esprit, février 2007, p. 218-222. ^ The Huston Smith Reader: Edited, with an Introduction, by Jeffery Paine, p. 6. Études Traditionnelles n. 293–295 : Numéro spécial consacré à René Guénon. Pierre-Marie Sigaud (ed.) : Dossier H René Guénon, L'Âge d'Homme, Lausanne. ISBN 2-8251-3044-3. Jean-Pierre Laurant and Barbanegra, Paul (éd.) : Cahiers de l'Herne" 49 : René Guénon, Éditions de l'Herne, Paris. ISBN 2-85197-055-0. Narthex n° trimestriel 21-22-23 de mars-août 1978 (et semble-t-il dernier), Numéro spécial René Guénon with two contributions by Jean Hani and Bernard Dubant (journal printed at only 600 samples which can now be found only at Bibliothèque Nationale, Paris). René Guénon and the Future of the West: The Life and Writings of a 20th-century Metaphysician. Accart, Xavier : Guénon ou le renversement des clartés : Influence d'un métaphysicien sur la vie littéraire et intellectuelle française (1920–1970), 2005, Edidit. ISBN 978-2-912770-03-5. Chacornac, Paul : La Vie simple de René Guénon, Éditions traditionnelles, Paris. ISBN 2-7138-0028-5. Evola, Julius : René Guénon: A Teacher for Modern Times. Gattegno, David : Guénon : qui suis-je ?, Éditions Pardès, Puiseaux (France). ISBN 2-86714-238-5. Gilis, Charles-André (Abd Ar-Razzâq Yahyâ) : Introduction à l'enseignement et au mystère de René Guénon, Les Éditions de l'Œuvre, Paris. ISBN 2-904011-03-X. Gilis, Charles-André (Abd Ar-Razzâq Yahyâ) : René Guénon et l'avènement du troisième Sceau. Éditions Traditionnelles, Paris. ISBN 2-7138-0133-8. Hapel, Bruno : René Guénon et l'Archéomètre, Guy Trédaniel, Paris. ISBN 2-85707-842-0. Hapel, Bruno : René Guénon et l'esprit de l'Inde, Guy Trédaniel, Paris. ISBN 2-85707-990-7. Hapel, Bruno : René Guénon et le Roi du Monde, Guy Trédaniel, Paris. ISBN 2-84445-244-2. James, Marie-France : Ésotérisme et christianisme autour de René Guénon, Nouvelles Éditions Latines, Paris. ISBN 2-7233-0146-X. Laurant, Jean-Pierre : Le sens caché dans l'oeuvre de René Guénon, L'âge d'Homme, 1975, Lausanne, Switzerland, ISBN 2-8251-3102-4. Laurant, Jean-Pierre : L'Esotérisme, Les Editions du Cerf, 1993, ISBN 2-7621-1534-5. Laurant, Jean-Pierre : René Guénon, les enjeux d'une lecture, Dervy, 2006, ISBN 2-84454-423-1. Montaigu, Henry : René Guénon ou la mise en demeure. La Place Royale, Gaillac (France). ISBN 2-906043-00-1. Nutrizio, Pietro (e altri) : René Guénon e l'Occidente, Luni Editrice, Milano/Trento, 1999. Prévost, Pierre : Georges Bataille et René Guénon, Jean Michel Place, Paris. ISBN 2-85893-156-9. Robin, Jean: René Guénon, témoin de la Tradition, 2nd édition, Guy Trédaniel publisher. ISBN 2-85707-026-8. Rooth, Graham : Prophet For A Dark Age: A Companion To The Works Of René Guénon, Sussex Academic Press, Brighton, 2008. ISBN 978-1-84519-251-8. Sérant, Paul : René Guénon, Le Courrier du livre, Paris. ISBN 2-7029-0050-X. Tourniac, Jean : Présence de René Guénon, t. 1 : L'œuvre et l'univers rituel, Soleil Natal, Étampes (France). ISBN 2-905270-58-6. Tourniac, Jean : Présence de René Guénon, t. 2 : La Maçonnerie templière et le message traditionnel, Soleil Natal, Étampes (France). ISBN 2-905270-59-4. Ursin, Jean: René Guénon, Approche d'un homme complexe, Ivoire-Clair, Lumière sur..., Groslay (France). ISBN 2-913882-31-5. Vâlsan, Michel : L'Islam et la fonction de René Guénon, Chacornac frères, Paris, 1953 (no isbn) and also Editions de l'Oeuvre, Paris. Vivenza, Jean-Marc : Le Dictionnaire de René Guénon, Le Mercure Dauphinois, 2002. ISBN 2-913826-17-2. Vivenza, Jean-Marc : La Métaphysique de René Guénon, Le Mercure Dauphinois, 2004. ISBN 2-913826-42-3.